Ukraine’s membership in the Customs Union of Russia, Kazakhstan and Belarus in a ‘3+1’ format is impossible, says Dmitry Medvedev, Russia’s prime minister. 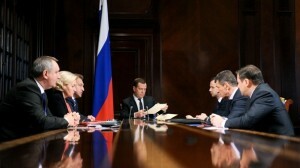 “It is obvious that a country that has adopted and ratified all Customs Union and Economic Union documents can be a member of the Customs Union and the Future Eurasian Economic Union,” Medvedev said in a meeting with deputy ministers. “Our Ukrainian friends like to speak about a 3+1 format and things like that. There will be no 3+1 format. It’s either all or nothing, but then it will be observer status or something else,” he added. In turn, Kiev said they are interested in cooperating with the Customs Union as an observer state. Ukraine has repeatedly voiced its intention to join some of the clauses of the Customs Union. For recession-hit Ukraine, the Customs Union is a necessary move to cut gas prices. The country has been pushing for negotiation on the 2009 gas agreements that impose the minimum “take or pay” clause. In January Russia’s gas major Gazprom sent a $7 billion bill to Ukraine’s Naftogaz firm, as compensation for having imported less gas, than the clause stipulates. For Ukraine gas pricing is now a crucial precondition to receive an international bailout, as the IMF requires lower energy subsidies. At the same time Ukraine proclaimed a strategic course on Euro-integration and seeks to sign a free trade agreement with the European Union.